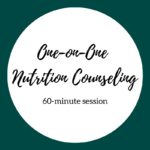 Work one-on-one with me to create an individualized plan to help you achieve your health goals. Available in person, over the phone, or online. When your payment has been received, I will contact you directly to set up an appointment.